Imagine waking up, rolling out of bed, and placing your feet onto 100-year old wide beam Douglas fir used flooring salvaged from an old school. No piece is alike, yet each is imbued with character and history. Compared to carpets and other manufactured floor coverings, real wood flooring lasts with timeless grace and pays for itself in longevity, ease of maintenance, and earth-friendliness. Unfortunately, high-quality flooring but can be a strain on the budget. Salvaged flooring is a sustainable and economical option, but it does require a bit more research and preparation. Why use reclaimed flooring? Salvaged flooring is as good as (if not better than) new flooring. Much of it is crafted from old-growth with exceptional beauty, length, color and character – all qualities difficult to find in modern wood flooring. Reclaimed floors are often reasonably-priced, which helps offset the labor involved in any sorting, grading, or cleaning that the flooring might need. And best of all, if you’re lucky enough to find beautiful old-growth wood, you can enjoy it without guilt! How to find the right flooring for you: First, decide upon the design and function of your project. Next, educate yourself on the different qualities of different woods. Do you want gym flooring, planks from a historic building, or barn wood? Softwoods such as fir work well in bedrooms and private areas. Hardwoods such as oak work well in high-traffic areas. Finally, visit The RE Store and other used building materials outlets to learn about their inventory. Ask about species, dimensions, grain, age, history, color, and function. Don’t forget to start early. If you want to purchase purely reclaimed, procuring a consistent quantity of flooring that matches your project will require long-term planning. What to look for when purchasing: At The RE Store, we never accept lumber that shows signs of rodent damage or insect infestation. But that isn’t always true for everyone. If you’re interested in using lumber that was exposed to the elements, consider getting it kiln dried or professionally processed. Most importantly, look for consistency. Variations are common in quality and, most importantly, in thickness (variance of more than 1/16″ may be difficult to sand evenly). Be wary of heavy finishes and dirt in the grooves and on the tongues — his will add sanding and cleaning labor. Get advice from others who have worked with used flooring. Remember that reclaimed flooring is not necessarily the same as distressed flooring. When flooring is reclaimed or salvaged, that means it has been removed by hand from a building where it was previously installed. The original use of the room will determine the amount of wear or weathering on the individual planks. Distressed flooring is often new flooring that has been mechanically distressed, scratched, or scraped to look old. 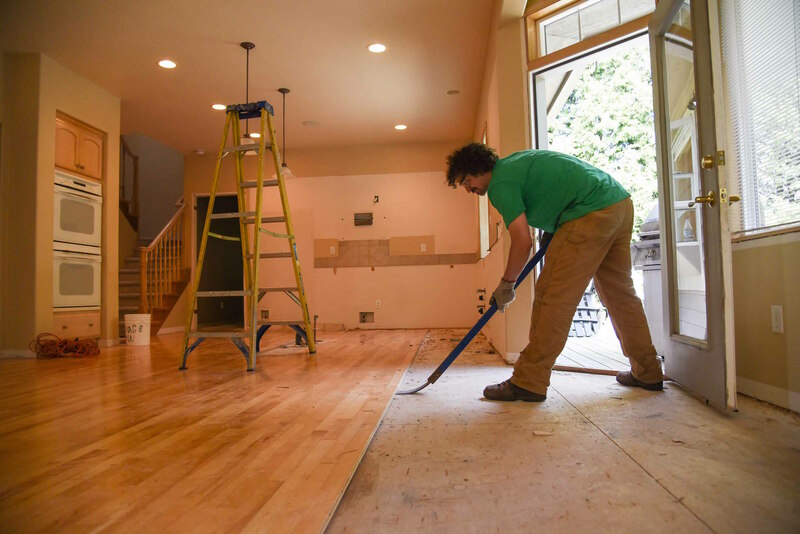 How to buy: Before you start purchasing flooring, calculate how much you’ll need. This blog post is a great reference if you are new to measuring square feet or have oddly shaped rooms. Used flooring usually comes de-nailed and often bundled in packages of 4 or 6 sticks for easy square-foot calculation. Depending on who removed the flooring, you may be dealing with a lot of waste, especially if it’s not end-matched. It’s best to buy 5%-10% more than you think you’ll need to compensate for broken pieces or heavy wear.